LIGHT-HEAVYWEIGHT is one of boxing’s original divisions and carries with it a rich history of diverse, talented champions and contenders. The current weight limit is 175lbs and it contains a top-heavy sprinkling of Ukrainian and Russian boxers, many of whom have set up shop in the United States and made themselves known to TV big hitters like HBO and Showtime in a way that was almost unthinkable 20 years ago. Gone are the images of Cold War Communist assassins coming to challenge the free world, but instead an embracing of heavy-handed, skilled boxers who are finding their way on to high profile cards and television slots with increasing regularity. 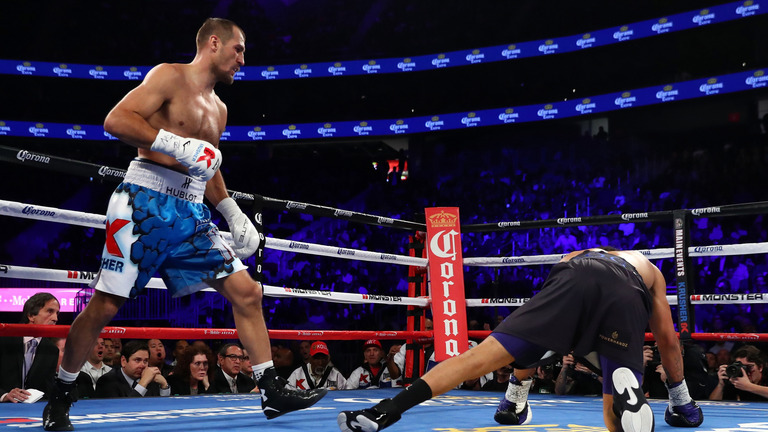 Sergey Kovalev has bounced back seamlessly after his back-to-back defeats at the fists of Andre Ward, winning the WBO belt against Vyacheslav Shabranskyy and defending recently with a hefty battering of game but overmatched challenger Igor Mikhalkin in New York. Also on that card was highly-rated Dmitry Bivol who completely mastered Cuba’s Sullivan Barrera in a supposed 50/50 bout. Kovalev vs. Bivol is a mouthwatering prospect and a unification as well now that Bivol holds a version of the WBA silverware. I was surprised at how easily Bivol dealt with Barrera. Using the jab, right hand and some excellent footwork, he showed a class and maturity to match his fearsome punching power. Another Eastern European beast holds the IBF crown. Artur Beterbiev has signed with Bob Arum’s Top Rank outfit after a spell with the PBC and celebrated his move by beating up Germany’s Enrico Koelling for his title. Beterbiev’s former manager Yvon Michel may prove to be his most troublesome adverary over the next few months, however, as the Canadian pursues his ex-client through the courts. It’s a shame, as a fit and active Beterbiev would be a quality addition to the mix, especially seeing as he once beat Kovalev in the amateurs. The final piece of the title jigsaw is Haitian southpaw Adonis Stevenson. Stevenson is fast of hand and possesses a monster punch but simply does not fight the best available opposition often enough. After defeating Chad Dawson emphatically to take the WBC he has fought a string of underwhelming mandatories and, quite bizarrely, despite holding lineage at the weight and a meaningful title he has become pretty much an irrelevance. As Adonis hits his 40th birthday his activity or lack thereof is a crying shame. The chasing pack contains a few fighters to watch as well.. The talent pool is relatively deep enough to suggest that a light-heavyweight World Boxing Super Series would not be unwelcome if the various parties were able to put pen to paper. Heavy-hitting Ukrainian Oleksandr Gvozdyk has been ripping through his opposition for a while now and European-level opponent Mehdi Amar will do well to make it into the second half of their fight this coming Saturday. Eleider Alvarez has been mandatory challenger to Adonis Stevenson for an age (accepting numerous step-aside payments it must be said) and appears no closer to boxing for the world title seeing as light-heavyweight newcomer Badou Jack is now slated to fight Stevenson on May 19. American southpaw Marcus Browne is highly-ranked with a couple of the sanctioning bodies. Browne can dig but is possibly slightly vulnerable in the chin department. One of the greatest light-heavyweight champions of any era was competing and dominating at the highest level relatively recently. Pensacola’s Roy Jones Jr was an exceptional talent who first introduced himself into the division with a win over badly faded former great Mike McCallum in 1996. Jones picked up the interim WBC title for that win and the Florida man and the WBC would have an interesting courtship over the years. In 2004 Germany’s Graciano Rocchigiani sued the organisation for $31million after claiming he had been unfairly stripped of their 175lb title and the judgement was agreed upon and passed by a New York district court. Then-president Jose Sulaiman (now deceased) managed to ride out the storm and the organisation continues its operations today, virtually unscathed. None of this litigious action necessarily affected Jones’ ability to perform in the ring, however. After defeating McCallum he suffered his first loss as a professional, to Montell Griffin. It was a loss in name alone as Griffin was hit while on the canvas and Jones subsequently disqualified. Jones had been given a decent scrap by Griffin up to that point but it did little to damage his aura of invincibility as Roy mopped up Montell in a single, vicious round when they rematched shortly after. Jones’ interim WBC belt had by this point been upgraded to full title status after France’s Fabrice Tiozzo decided he would move up to cruiserweight and leave his strap behind. Roy continued to collect belts as his light-heavyweight career progressed, including the WBA strap which he won against former sparring partner Lou Del Valle who actually briefly dropped Jones (in round eight) but was never in danger of winning the contest. Roy won the IBF belt in 1999 after dominating Reggie Johnson and became the first undisputed king at 175 since Michael Spinks dropped his belts in 1985 and started a heavyweight campaign. Jones arguably loved bauble collecting ever since he had been robbed of the gold medal at the 1988 Olympics in Seoul. By the time he was outpointing Mexico’s unbeaten Julio Gonzalez in 2001, the WBF, IBA and IBO had tagged along for the ride and Roy was more than happy to pay the sanctioning fees and drip these multiple titles across his body after each defence. After knocking out hapless Aussie Glen Kelly with a punch that came from behind the back and then outclassing Clinton Woods, the Pound-for-Pound boxing kingpin decided that he had outgrown the lack of competition in the weight class and skipped cruiserweight altogether to campaign for one fight only at heavyweight. Jones notoriously boxed plodder John Ruiz and produced a boxing masterclass to relieve Ruiz of his WBA strap and seal a place in the pantheon of the greats. Not content with merely retiring and living on his reputation and sizeable bank balance, Jones sought out fights with the likes of Mike Tyson and even came close to boxing Lennox Lewis at a point. Neither matches came off and Jones instead moved back down to light-heavyweight to reaffirm superiority over his old stomping ground. Just six months after competing at heavyweight, Jones burned off all of the excess muscle and looked a shadow of his former self when defeating Florida rival Antonio Tarver for three of the light-heavyweight straps (one being the lightly-regarded IBO). Roy took the rematch and was brutally stopped by Tarver and closed out a devastating fall from grace in 2004 when road warrior Glen Johnson also knocked him out. Tarver settled the score for good in early 2005 with a second win over Jones and confirmed that he had acquired the torch at light-heavyweight. Jones’ association with the 175lb division was not over yet though. He boxed on until a 2009 move up to cruiserweight and enjoyed varying levels of success. The corpse of Jeff Lacy was one of his victims as was former welterweight destroyer Felix Trinidad who had bizarrely moved up in weight. Roy gave some scares to Joe Calzaghe in 2008 but was ultimately outpointed in New York. Regardless of the inauspicious ending to his career, Jones will go down as one of the greats of the light-heavyweight division from any era.